Indian Food Rocks: It's Thank You time! there's something for you at jugalbandi. Manisha...thats so sweet of you...and yes try that nawabi one and you will love it...thats the most wonderful one I remember having when I was eating meat! 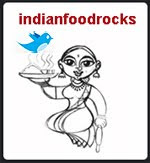 Ooh, thats a great one, Manisha-cuz' you highlight the yummy delights from each blog :). Many of these blogs are universal favorites! You say the sweetest things, Manisha. And you spin quite the web yourself, where we all get entangled...Thanks for writing IFR! Wow....I'm amazed by the number of blogs that popped up in the last year. I have over 200 blogs on my rss feed...but still more than 75% of the blogs you listed here are not on it. I need to rectify that soon! Oh, you've done so much hyperlinking! I really enjoyed reading all of these nice things you've had to say- especially those about me! [dabs his eye] Cheeky sentiment aside, you really made my day TLO! Manisha really nice of you to apriciate the other food bloggers. I even founnd new blogs which i didn't know. Thankx. Congrats on all the click wins. Congrats on being one of the winners of *CLICK*. Yay! I got the Click Concept award! I am so thrilled! Thank you all very much! Srivalli, I couldn't believe that you make something so delicious yet don't eat it?! How?! How?! Musical, glad you like it! I quite enjoy it, too! Priya, now don't make me cry! [sniff!] I think we have built ourselves a wonderful community. Good luck to you always! Anita, [deep bow] and I am glad we found each other! Nabeela, there's an ongoing explosion and I am afraid I can't keep up. I miss out on a lot of really good blogs. Which is why the blog events help so much! Pel, you have made my day on so many occasions! What can I tell you? Happy Cook, glad you found new blogs to read through this list. Cinnamon, this is just the first instalment. I was hoping to do this more often - every 6 months at least - but better late than never. Gini, all the entries were fabulous! This is an entry that is begging to be made! Manisha ...sniff, sniff, ...Thank you red-checks! Hugs. Manisha, just saw this post... thank you! You made my day!! I just saw this, Manisha thank you very much for including my blog. i love you blog too.